Well, if you can believe it, I only worked for 3 days!!! I knew after the first day that it wasn't for me, but decided to keep trying. I liked the work, but I didn't like having to push memberships to the place, I am not a seller, and time didn't seem to mean anything to the person I was working for.....no one else there was married, or had a family, and when you are expecting to get off at a certain time and don't...and have a daughter waiting for pick-up...it's not good....so I thanked my boss very nicely for giving me the chance, but it just wasn't for me. Part of me is relieved, part of me is sad...but what is meant to be...is meant to be.....right? I will find something eventually that will feel right. In the meantime, we are on our last full week of summer vacation here. Today we went to the beach (well myself, my youngest and her friend)...this is a new to us beach...and I am in love!! It was absolutely gorgeous!!! We are going back on Wednesday!! Summer is winding down here in eastern Nova Scotia....we are down to our last two weeks of summer vacation. As for me...I start a new chapter of my life tomorrow! I am going to start working part-time!! It's been 11 years since I technically worked outside the home...I did do three years of lunch-time duty at the kids school, but this in official part-time job! I will be working at a Massage Therapy Clinic about 20 hours per week. I am hoping it works out...it will be a nice change...and if it doesn't work out (or at least this job doesn't work out)...it's not the end of the world. 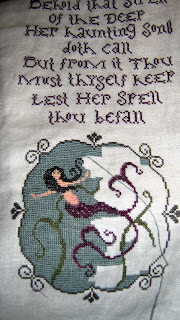 I've been busy stitching too! 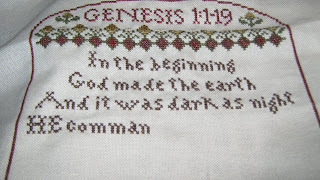 I started "Seven Days of Creation" by Plum Street Samplers.......I do love Paulette's designs..this one is stitched on 32 count..
.and I also started (and "almost" finished)"From The Deep" also from Paulette.....this particular design will hang in my bathroom when done. It's stitched on 32 count as well. 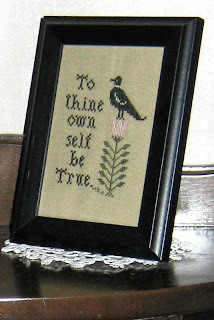 ....AND....I finished up this freebie that Paulette designed......it's stitched on 40 count!! My first attempt at 40 count, and I LOVE it!! 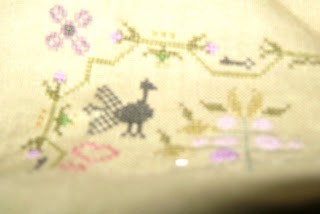 I also started Jenny Bean's Humble Servant Sampler and it's stitched on 40 count!! Who knew that I would love this count!! Sorry for the bad photo of Jenny Bean!! I cannot seem to get a clear photo of this one!! hope you are all still with me for when I start Blogging more in the coming weeks!